On this week's episode of Citations Needed, Adam and I discuss the particular breed of liberalism known as “New Atheism,” with guest Luke Savage. While the New Atheist movement is hardly a monolith, it has at its core features of liberal chauvinism, anti-"political correctness," “science,” secularism, and a general deference to U.S. foreign policy consensus. 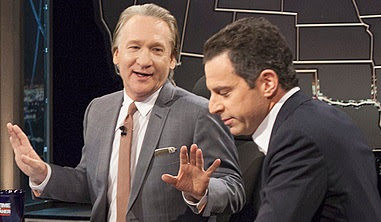 Its most well-known champions, Sam Harris, Richard Dawkins, Maajid Nawaz, Bill Maher, and the late Christopher Hitchens, were and remain major features in mainstream liberal discourse – from television shows on HBO to major podcasts to writings featured everywhere from The New York Times to The Guardian to The Daily Beast. For years, however, leftists of all stripes--anti-imperialists, socialists, progressives--have expressed concern over this brand of liberal chauvinism, its out-sized place in the media and its ability to turn the U.S., and white Americans in particular, into The Real Victims™ ; its ability to offend the religious while championing boilerplate National Security consensus and imperial wars abroad. It seemed vaguely provocative but who was it really offending? And, more importantly, who was it serving?